I was filled with anticipation when le mummy 1st told me that China Republic @ World Square would soon be opening and that we would be attending the Official Opening! Now, we have been to World Square numerous times this year and have seen the restaurant space boarded up for so long that we had almost given up hope! But they do say that all good things come to those who wait (albeit impatiently) and today we were greatly rewarded! Mind you, China Republic has not yet opened their doors to the public and this week has only been a dry run. Well, mummy managed to kill more than 2 birds with 1 stone by arranging this gastronomic opportunity. 1st bird: We were one of the 1st hundred (or 3!!) 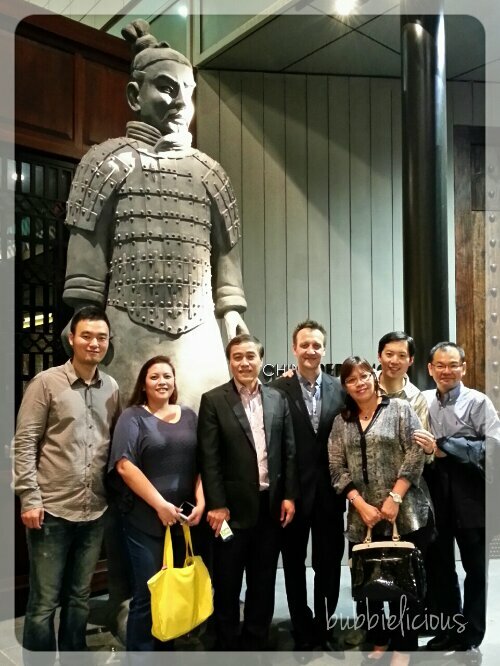 in Sydney to sample China Republic’s dishes. 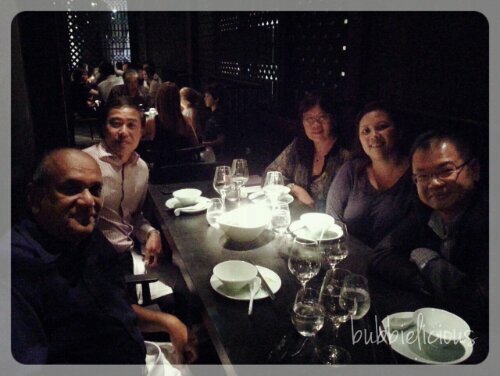 2nd bird: Food tasting for Temasek Club‘s Food and Wine event to be held this December. 3rd bird: Her daughter no longer has to wait till the end of November. 4th bird: I was shown around the restaurant personally by Fiona (Mike’s wife) and so I managed to take LOTS of photos!! So happy! While waiting for Eric, Viva and CY to arrive, I took the opportunity to begin my tour! A terracotta warrior “guards” the entrance. China Republic took over what was previously a pub that had a little Al Fresco area along the walkway. That area is now an extension of the restaurant. What was once Al Fresco… is now a cosy alcove! I love how the use of wood gives the alcove a really cosy feeling. 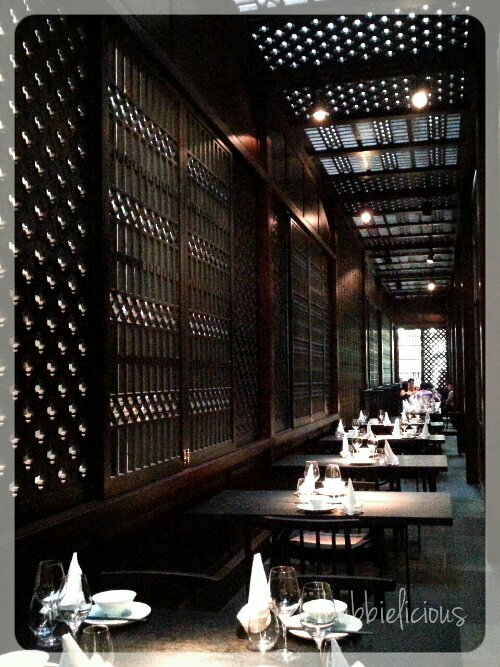 The latticed wood gives the restaurant an Ancient-China feel. 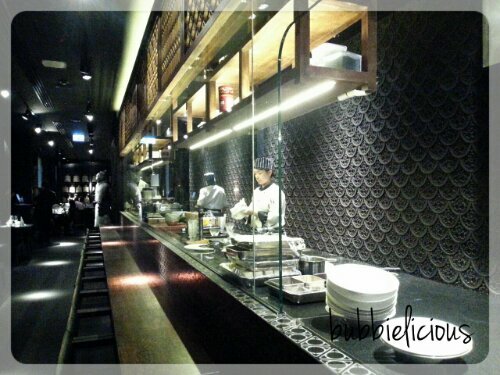 Those spotlights on top provided PERFECT lighting for foodie photographers like myself! A definite plus! There is a problem with the openness of the alcove though; dust from George Street is constantly blown in! The thing with human beings is that we are bothered by what we CAN see! 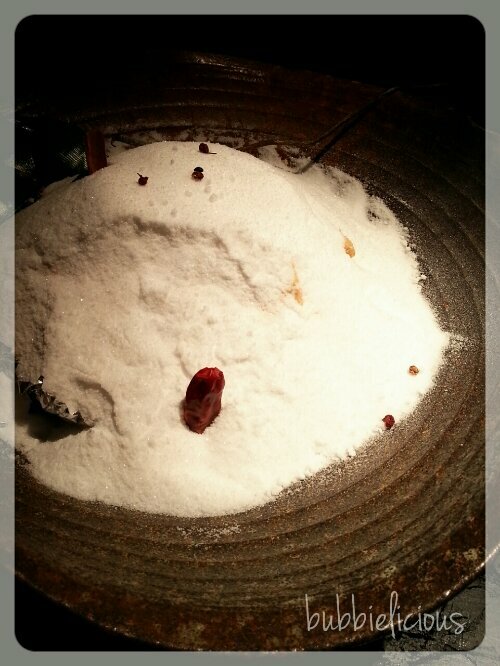 Throughout the dinner, we could clearly see dust fly past. Maybe placing some perspex on top of the alcove would counter this? 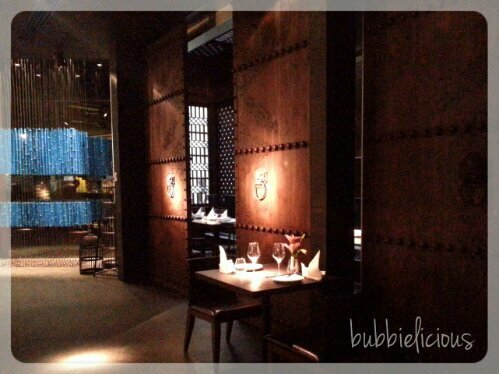 Huge wooden doors run the length of the side of the restaurant. These can easily be closed to separate the alcove from the main restaurant. 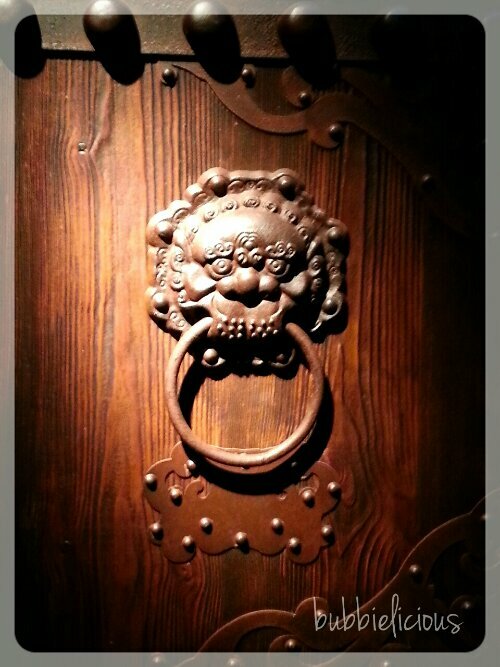 These doors and their attached knockers were all specially shipped in for the restaurant. Theses knockers were purposely aged! Shhhh! They did such a good job that you would not be able to tell the difference! I checked. They even had that rusty texture on them! Bamboo has always been identified with China because pandas eat bamboo! Hahaha! A feast not only of the taste buds but also the eyes. The front of the kitchen is enclosed in glass and offers diners a wonderful photo opportunity as dumplings, cold noodles and desserts are churned out from this station. I spent a lot of time at this station just snapping away and chatting to staff. All of them were accommodating and happily took the time to explain the dishes and ingredients used. She happily struck a pose when I said “笑一个!” Haha! So cute, right! 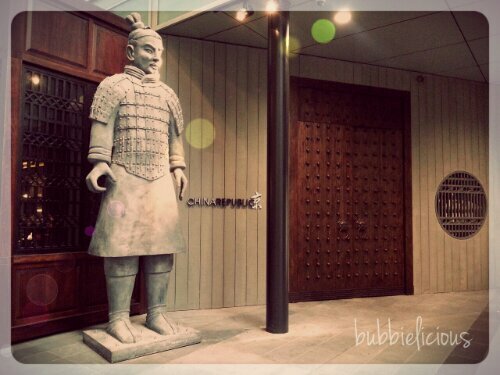 You’ll find memories of Beijing all around the restaurant… terracotta warriors, replicas of The Forbidden City and even a moat (of sorts)! 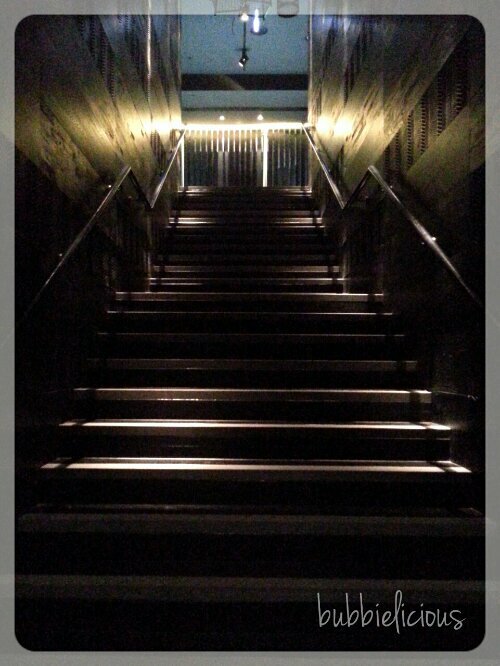 Let’s see what the 2nd floor has in store, shall we? 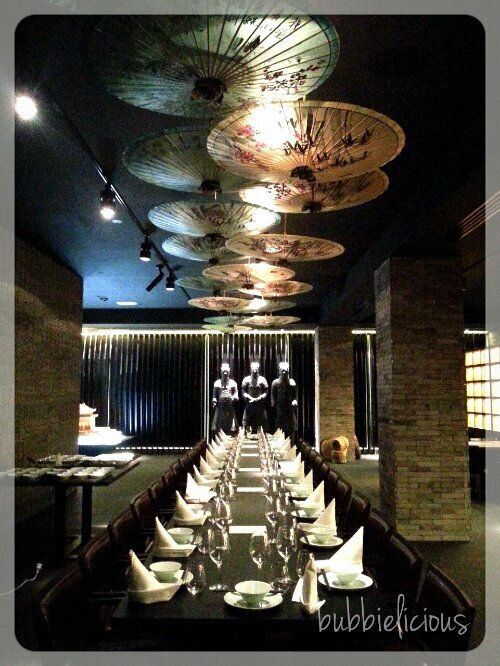 The 2nd floor of the restaurant is reserved for private functions and houses a 4 VIP/private rooms of different seating capacities, with the biggest room featuring a table large enough to seat 20 people! 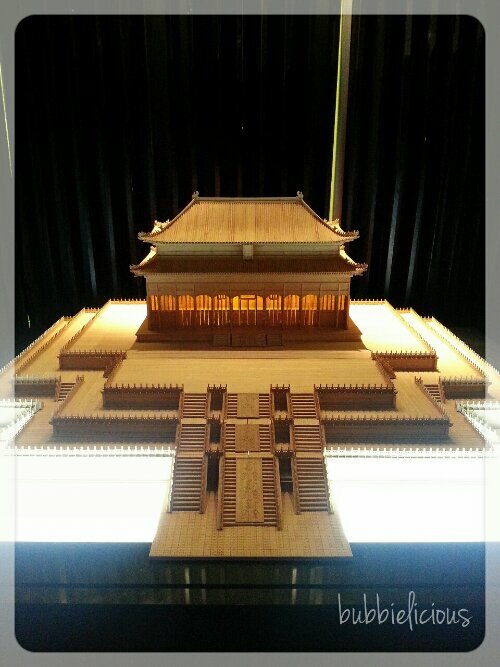 What 1st greeted us at the top of the stairs was another intricately handmade replica. 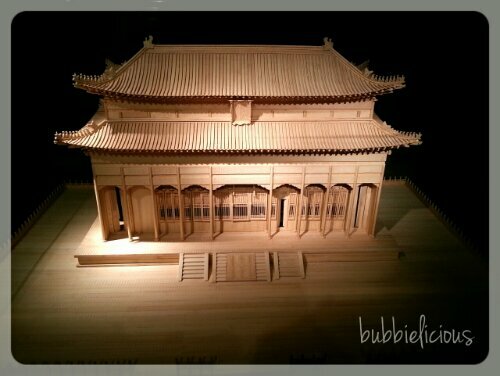 This is The Hall of Supreme Harmony (太和殿) of The Forbidden City. 3 menacing terracotta warriors “standing guard” while you eat. This area seats approximately 60 people. Nice and cosy for a small function, don’t you think? 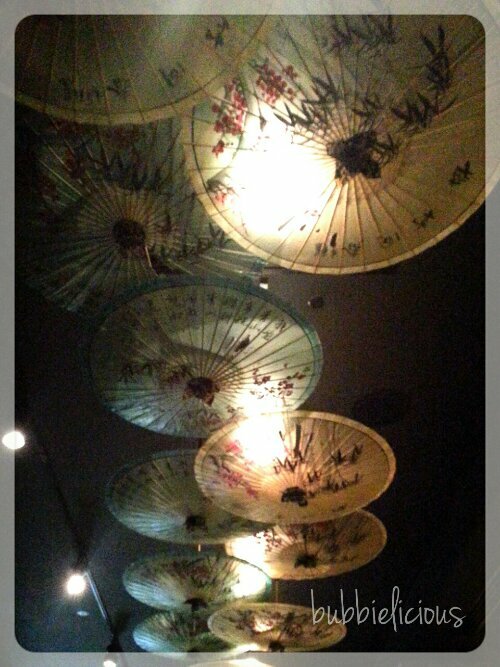 Pretty brollies make for a beautiful feature! Rows and rows of Chinese tea pots! Fiona explained to me that all these tea pots are different and one of a kind. Why? They all have phrases carved into each tea pot! 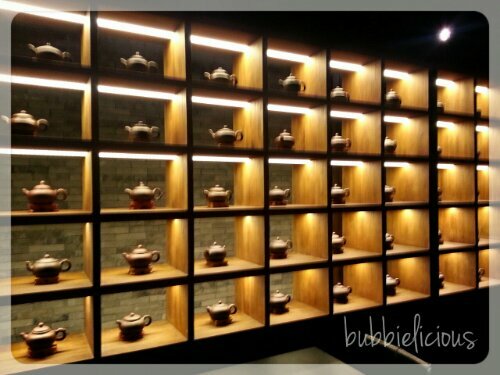 This wall of tea pots is not only a display. 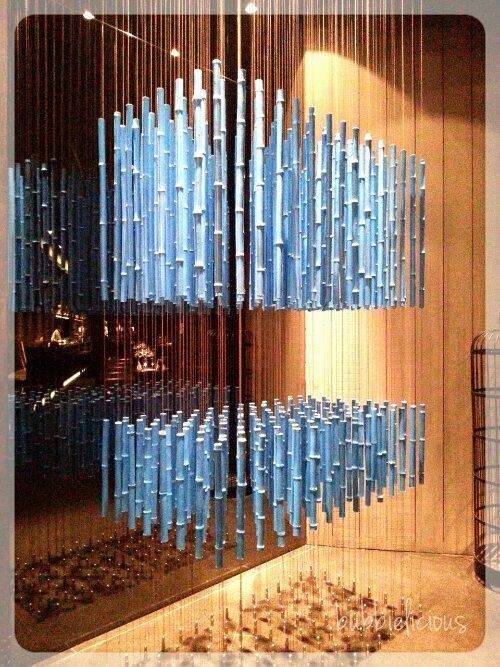 It also acts as a room divider that shields the entrances to the VIP/private rooms from prying eyes! A simple yet functional design that also embodies Ancient Chinese influence. Being female (well, trying to be a more typical female), we had to pay the bathroom a brief visit! This is my very first time seeing a unisex bathroom. Period. Questions popped into my head “How do both sexes share a bathroom?”, “What kind of privacy do we have?”, “Omg, I cannot adjust my bra in front of the mirror? ?”, “How to touch up make-up with a man staring?”!! As I entered the bathroom, I looked around and there was nothing but a huge mirror facing 4 doors. 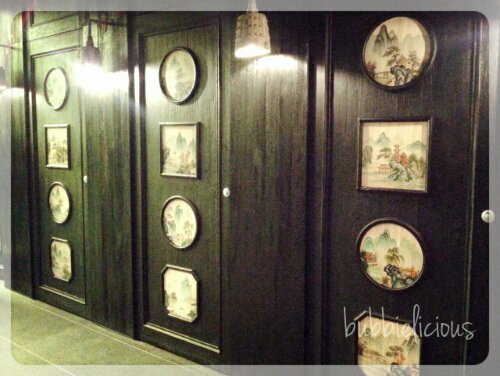 On these doors are beautiful watercolour pictures of China’s scenery. Hmmm “where’s the sinks?” I asked Fiona. Then she opened one of the 4 doors. With that, all my questions were answered. There were individual sinks and mirrors in EACH cubicle! Haha! How ingenious! Just as the tour ended, the rest of our table arrived and we left the food and wine selection to Jason, Executive Director of China Republic. 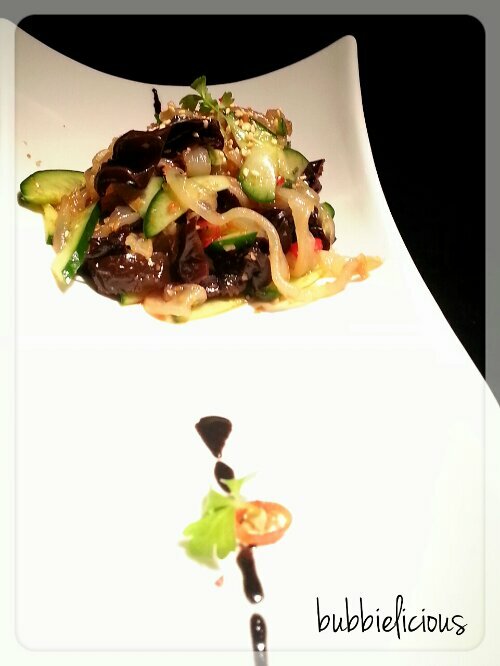 With our 1st set of entrees being cold dishes, we were served Pegasus Bay Riesling 2010. Now, I’m not a white wine drinker mainly because most people drink Chardonnays which I find too dry. However, I am converted with this New Zealand Riesling. It embodies everything I look for in a wine; a generously fruity bouquet and flavours, full-flavoured, not too dry and a little sweet. Clean and crisp. Delicately seasoned and very appetising. Goes very well with the Riesling. No more boring jellyfish that you usually get with a cold platter. 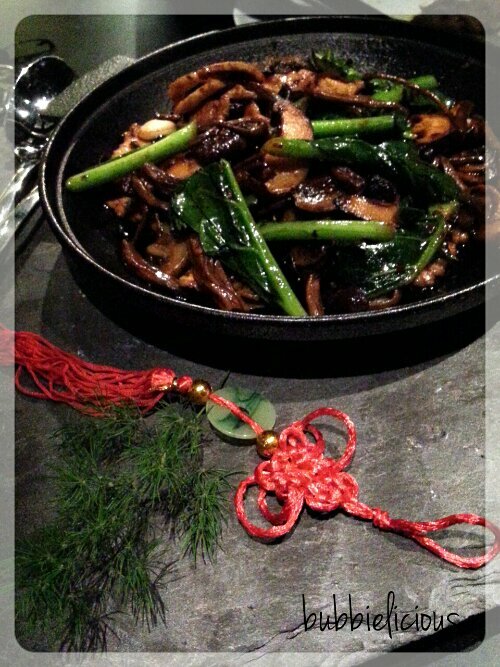 This dish is very well spiced and brought up a level with the inclusion of crunchy black fungus and crisp cucumber slices. 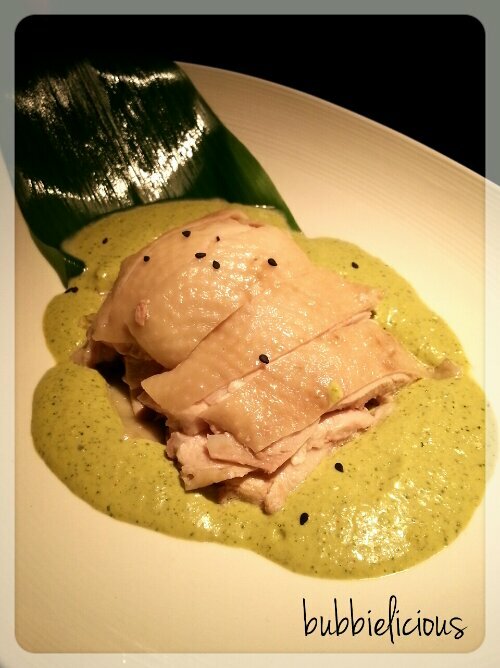 My 1st impression of this dish: Hainanese Chicken Rice!! Hahaha! The chicken is boiled and cooled before it is chopped up. I can taste the distinct “jelly” in the chicken that you can only get with this process. Be warned though, the lemon sauce is laced with Sichuan pepper. 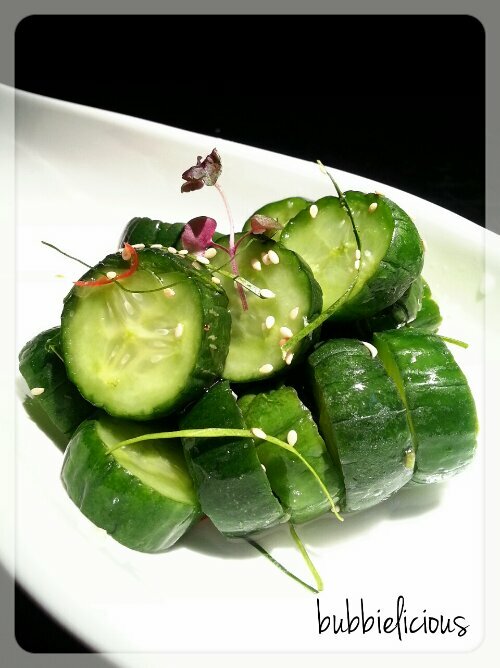 It is not spicy per se but it does give you such a mouth-numbing after effect, you’ll DEFINITELY go back for more! Do NOT be fooled by the chilli oil. I find that in Sichuan cuisine, there’s chilli oil and then there’s chilli oil. When chilli oil is properly spiced, it becomes an extremely delightful sauce, packed with a myriad of flavours and not just chilli and oil. 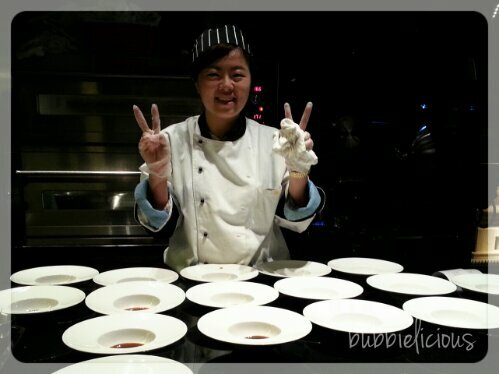 Although there were teething problems with the ordering system, the professionalism of the waitstaff in handling the situation more than made up for it. This is exactly why it is imperative that all hospitality establishments have dry runs! Not only does it give you the opportunity to tweak SOPs but it also shows your customers that you value service and quality standards in your establishment. So we took the opportunity to chat with our servers and take a group photo. Next on the menu were a soup to share and a chicken dish. I was taught that white wine complements white meat! We were poured a glass each of Margaret River Cape Mentelle Sauvignon Blanc Semillon 2013. This was not what I expected from a Sichuan hot and sour soup especially since I’ve already had the best hot and sour soup in town. But I gave it a 2nd chance! It started off all unassuming but the flavours started to build up in my mouth and the spiciness of white pepper shines through. I have a pet peeve when it comes to hot and sour soups. I absolutely HATE it when they include ingredients like shrimp and char siew simply to make it worth your buck. NO! Soups are good only when effort is taken to make a good stock. 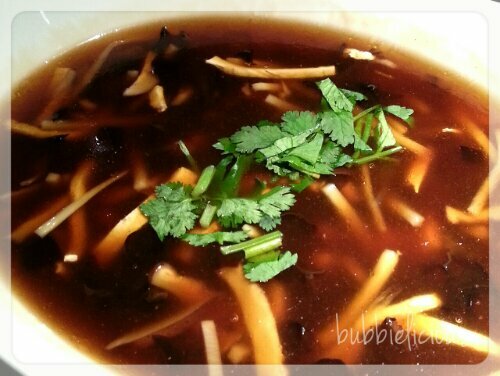 This bowl of Spicy and Sour Soup is simple, flavoursome and fresh. Freshly-made bite-sized morsels of dumpling goodness. I popped one into my mouth and images of a mother wrapping dumplings at home appeared in my mind. 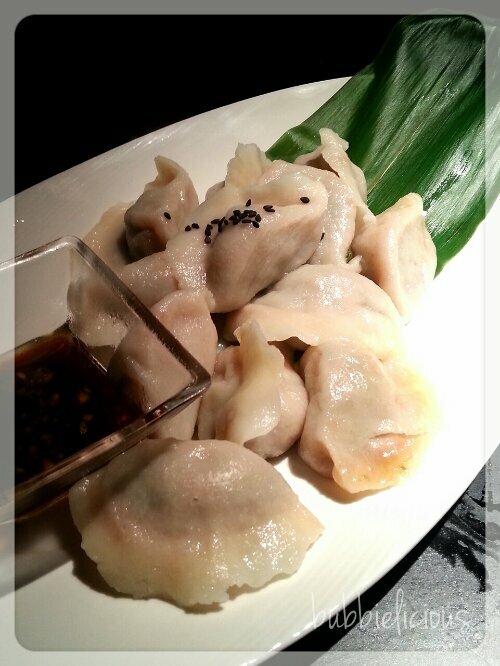 You know, rustically homemade dumplings made with love, a mother to her child. 家乡味道! Out emerged the Emperor’s Chicken!! So why is it called Emperor’s Chicken? The men reported this to the emperor. He ordered a chicken to be done in the beggar’s way, and it turned out to be the best chicken the emperor had ever enjoyed. Since the emperor liked it so much, it is also known as Emperor’s Chicken. Today the dish is still done in the beggar’s way. 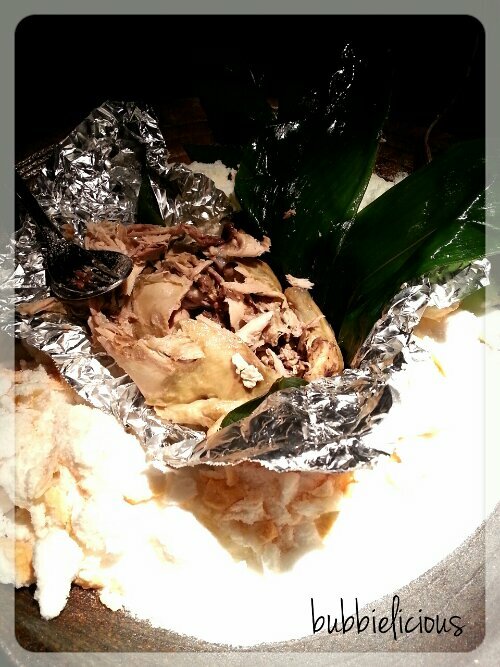 Clay is still used to cover the chicken, and lotus leaves are still between the chicken and clay. 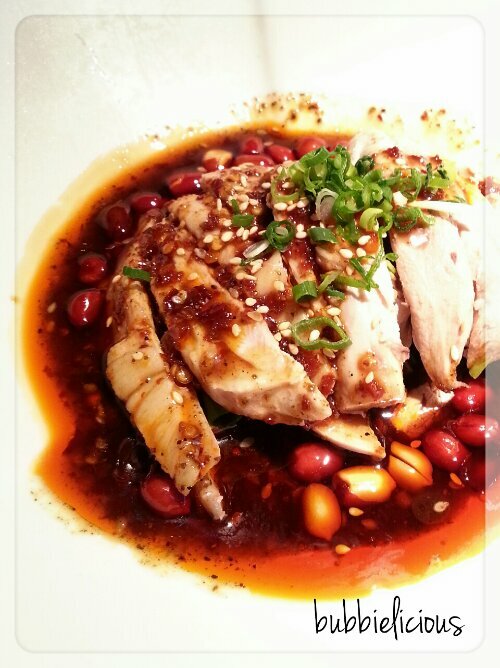 This is very similar to the Steamed Herbal Chicken we get in Singapore. The chicken is so moist and tender and falls off the bone. Click on the video below to watch Tiffany in action! Served in its shell, atop a raw stone for a plate, it emulates a winter with “pine trees” and “snow” on a mountain. Crispy on the outside, soft and milky on the inside! Ok, a confession 1st. I hate cooked oysters. I hate them tough and chewy. I’m not even a fan of kilpatrick. I love them fresh and raw and freshly shucked. As we come up to the dark meats and stronger tasting dishes, we were served Hinton Estate Vineyard Pinot Noir 2010. Food Photography made simpler with beautifully styled food. 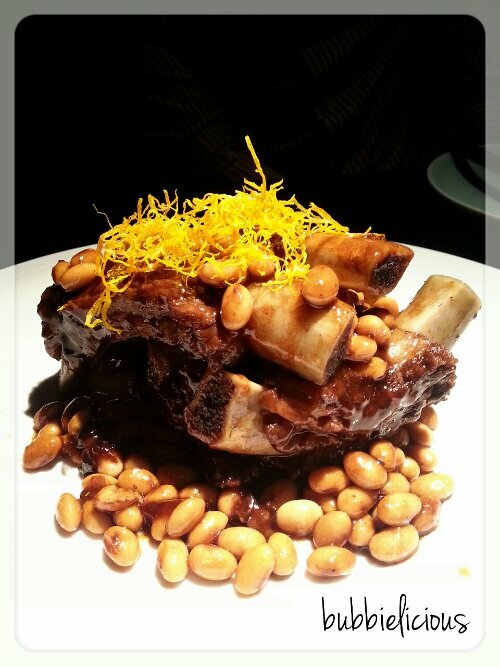 The aroma of the braised pork ribs is DIVINE! As soon as the dish was placed on our table, a whiff of that tantalising aroma stole my attention. The pork ribs were braised to perfection. The meat fell off the bone so easily and melted in our mouths. Even the soy beans were so delicious with the sauce that le mummy and I couldn’t stop eating them! Haha! 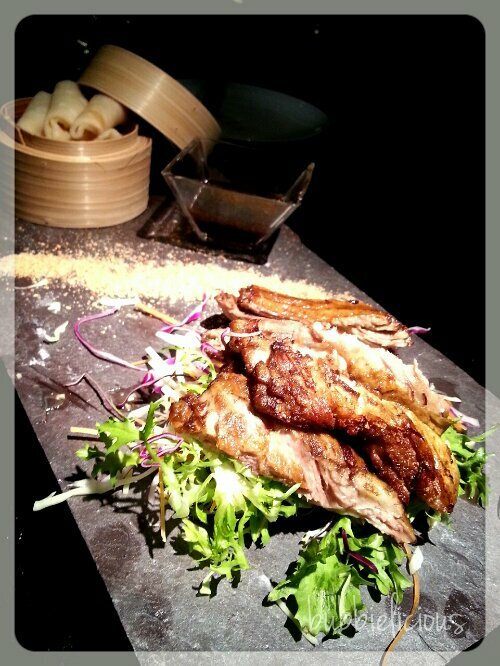 Our only gripe with the dish was that the pork ribs weren’t individual pieces and it was difficult to cut food up to share with chopsticks. I’m not sure but I think that’s chye sim included in there. Also, if you are planning to order this as a vegetarian alternative, do let them know 1st as there’s meat present in the dish. I LOVE this dish. 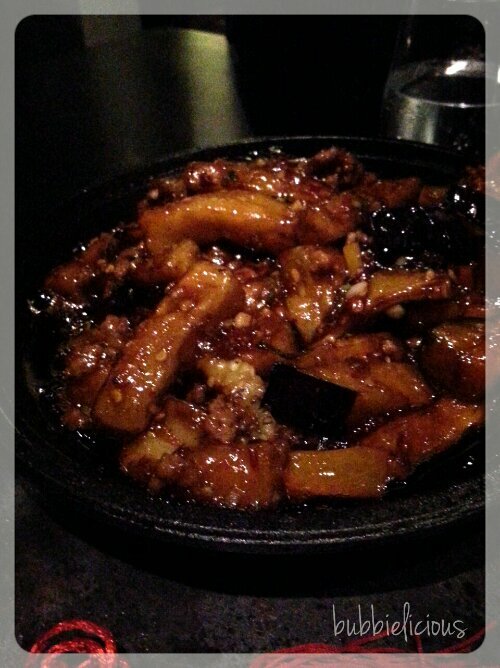 I love eggplant cooked this way. The eggplant retains it’s shape, a little firmness and not swim in oil. 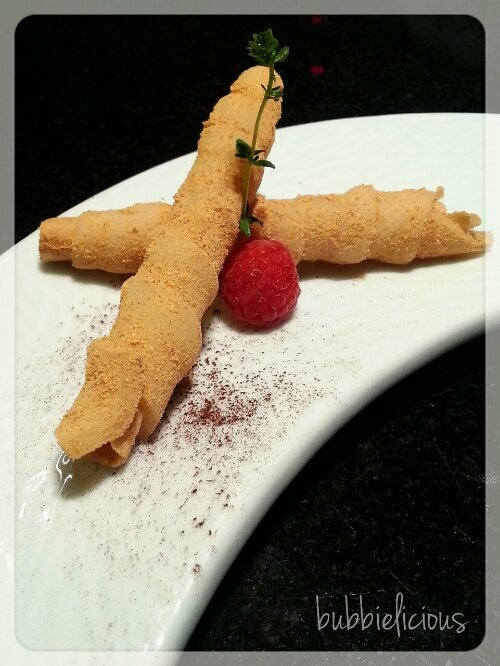 With that, dinner was concluded and our dessert session began! 🙂 Frangelico on the rocks were served with desserts. 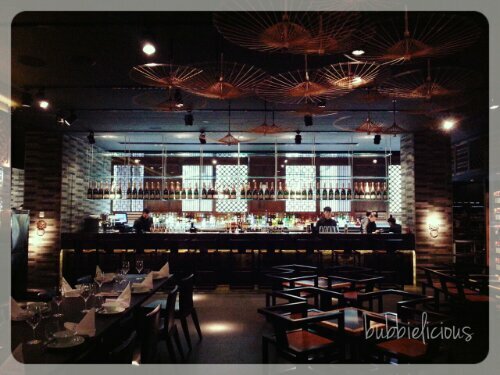 Muah chee with a modern twist! Think traditional muah chee balls. This however is rolled out flat and sliced into thick strips before its rolled around a wafer stick then lightly coated. I like the chewiness of this dish but it tastes quite bland. Unlike the traditional muah chee balls, there is no sugar added. This was like biting into solidified black sesame paste! 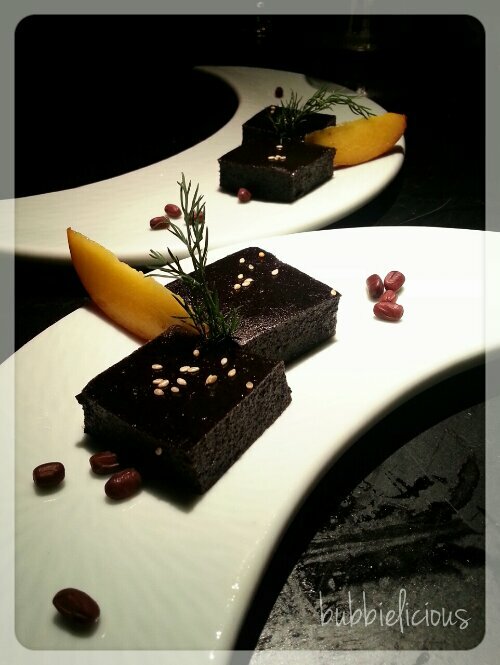 You can truly taste the roasted black sesame. The sweet osmanthus soup is very slightly sweetened only to enhance the delicate flavour of the osmanthus. It’s very light and very unlike the usual gingered soup we make at home. 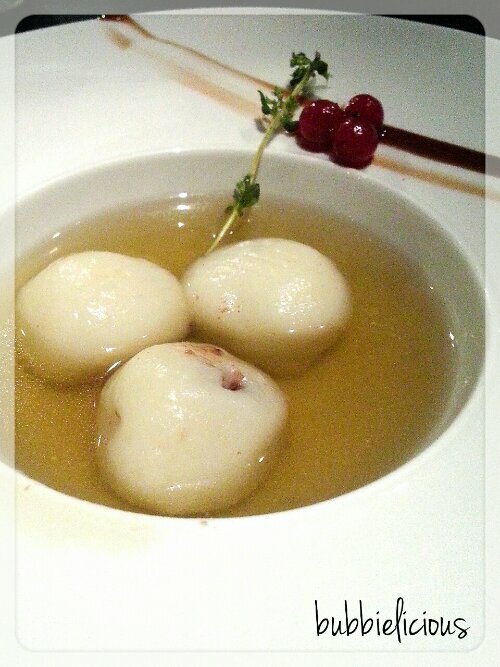 The skin of the glutinous rice balls were too thick for our liking but I loved the sweetness of the red bean paste inside. 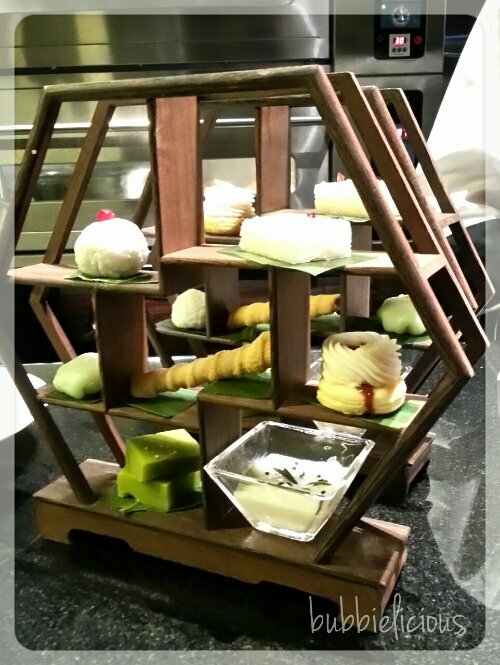 An assortment of desserts!! I find that the Chinese prefer their desserts light and not too sweet. Quite the opposite to what us Singaporeans are used to. Many thanks to Mike, Sean and Jason for the hospitality extended to us. Not only was it a gastronomic affair, we also had an awesome evening spent in the company of genuinely friendly staff – Tiffany, Lauren and Elias. For those of you who cannot wait to satisfy your tastebuds, China Republic will be having their soft launch next Tuesday, November 12, 2013. 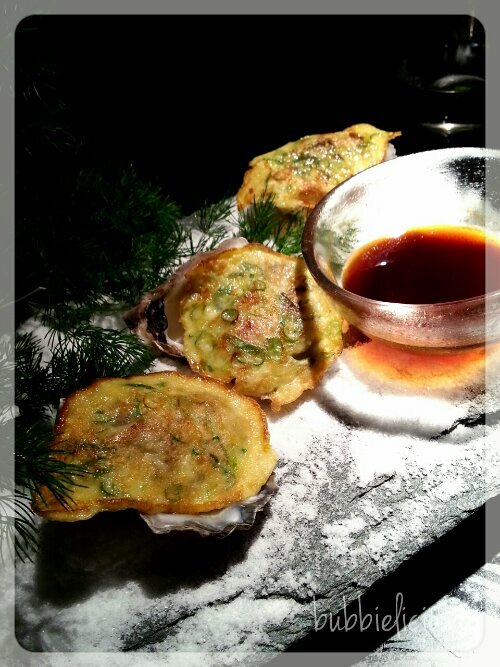 They will only be opened for dinner as they work their way to their official opening at the end of November 2013. For bookings, groups or events, please call or leave a message on their Facebook Page. Disclaimer: This is not a paid review. The entire content of this post is of my personal view and tastebuds and have not been influenced by the staff and/or management of China Republic.